I remember plenty of times during this compressed and crazed period between Thanksgiving and Christmas when I finally get home, pulling the car into the driveway with a sense of pleasant relief. Outside, it’s dark and cold and the house is warm and full of my kids and dogs. Greg and I look at each other and we both know what the other is thinking: take-out! But then my inner cook steps in and I know I will cook. And everyone will be happier for it. The kitchen is bright and cheerful, holding the dark night at bay. I roll up my sleeves, pour a glass of wine and get going. We all hang in the kitchen and eventually (and almost effortlessly), the meal gets on the table. It’s always better than take out. Slowing down enough to put a home-cooked meal on the table really does make the season bright(er). Melted cheese oozing into the hot marinara sauce crowns this dish with tempting glory. If you use jarred sauce or have some homemade on hand, this takes minutes from start to oven. Leftovers? 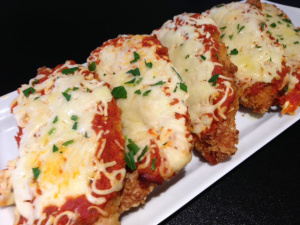 If you have any, try a chicken parm sandwich. You’ll love it! Season the chicken breasts on both sides with salt and pepper. Put the flour in a shallow bowl or on a plate, the beaten eggs in a bowl, and spread the bread crumbs in another shallow bowl or on a plate. Dip each breast first in the flour to coat both sides and then in the eggs to coat. Last, dip the breast in the bread crumbs to coat both sides. As each is coated, set it aside on a plate. In a large sauté pan, heat the oil over medium-high heat until the oil is very hot. Drop a few bread crumbs in the oil and if they sizzle, the oil is hot enough. Cook the chicken for 2 to 3 minutes on each side, or until golden brown. Lift from the pan with tongs or a wide spatula and transfer to a baking dish large enough to hold them in a single layer. Bake for about 10 minutes or until crispy and cooked through. Take the pan from the oven and spoon the sauce over the chicken to cover. Sprinkle with the grated cheeses. Return the pan to the oven and bake for 5 to 8 minutes longer or until the cheese melts and the sauce is bubbling. Serve hot. I am stealing your recipe! Thanks for sharing!